FAQ – COPAKE AUCTION INC.
What are your terms of consignment? Call Mike or Seth for our competitive commission rates. How do I get to the Copake Auction, Inc.? Or register from our online catalogue absentee bidding system. Master Card, Visa, Discover, Cash & Travelers Checks. First time buyers must establish credit prior to paying with a check. How will I know if my absentee bids were successful? If you are successful we will contact you by phone the Monday after a Saturday auction. You will NOT be notified if your bid was unsuccessful. How can I find out auction results? Post sale results are listed on our website the week after an auction. Where can I stay or eat in the area? Mon-Fri, 8:00am – 4:00pm (Out to Lunch 12-1pm) * We suggest you always call ahead 518-329-1142 before coming to pickup/drop-off to make sure a staff member will be here outside of end of auction pickup times. Are you there on weekends? No, only when there is an auction and/or Sunday morning pick up (9-10AM) after Saturday Auctions. How long do I have to pick up my items after an auction? Purchased items will be stored at a Copake Auction facility free of charge for (30) days after the auction. On the 31st day the items will be moved to an offsite storage facility to which they will incur Storage Fees. Can I ship a consignment to you? When will I be paid for my item/items that sold? The consignor will be paid (40) days after the day of the sale, contingent on payment being received from the buyer. Items not paid for (30) days after the sale can either be picked up by the consignee or resold by the auction house. Yes, if we agree on an estimate. A buy back fee may be charged. When will the catalog/online preview be available for an auction? Catalogs for each auction are available on our website approximately 1-3 weeks prior to the sale with pre-catalog advertising on featured items beginning as soon as they are photographed. When is the in house preview? Thursday through Saturday for regular Saturday Americana Auctions. Will you come pick up my items? If we are interested in your items we can come to you. Do you do onsite auctions? Yes, in appropriate situations we can sell right from your location. What types of items are you currently seeking? 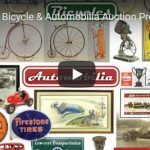 Americana, Estate Items, Antique & Classic Bicycles and more. Do you sell single items or primarily estates? We have had great success selling entire estates and single items. Quality counts over quantity. Do you take everything in an estate? We generally try to maintain a certain quality in our sales which would prohibit us from taking everything in some estates. Do you take items on commission basis only or will you buy items or estates outright? We offer both services, we will take items for commission or buy outright.